CDP Blog #3: Chord Diagrams! For blog #3, I wanted to talk about an graph or visualisation I’ve been working on, to help CDP display their data in a new way. 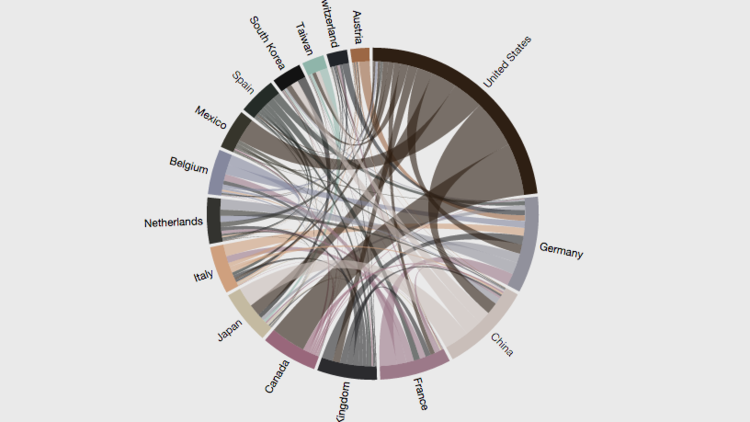 It’s called a chord diagram, looks a bit like a spider’s web and is used to show the strength and range of interconnections in whatever system you are looking at, for example the total imports and exports between different countries (PLEASE click for interactive version-much more fun!). Source: http://www.delimited.io/blog/2014/11/18/interactive-chord-diagrams-in-d3. In short, segments around the edge of the circle represent components of the system you are looking at, in this case countries, lines that link two segments indicate a relationship between the segments, in this case a trade relationship, and the width of the lines shows the strength of the relationship, in this example the total imports and exports between countries. In this blog I thought would write a bit more about the background of why I came to choose the CDP water team for my Charity Insights internship and how CDP communicates its work, as I think this is one of the most vital elements to its output and an area I imagine a lot of people could be interested in working in. So first off, why do I think water is so important? This year, the World Economic Forum listed water crises as the biggest Global Risk in terms of impact, based on a survey of nearly 900 global leaders in business, academia, and government. After a couple of weeks here at CDP I thought it was about time to give a summary of the work done by CDP and what I’ve been up to since the start of July. CDP (previously known as the Carbon Disclosure Project) are a global environmental non-profit organisation, whose goal is to increase transparency of environmental effects of companies and change the behaviours of companies for the better in three key areas: Carbon emissions, Water usage and Deforestation. CDP do this by asking companies to perform self assessments and disclose emissions and usage data by responding to CDP’s annual questionnaires on Water, Climate Change and Deforestation.